^ Minor, Bill (April 2, 2010). "New law meant to eliminate existing 'donut hole'". Editorial. DeSoto Times-Tribune (online ed.). Retrieved 2019-02-25. ^ Carter, Lauren. 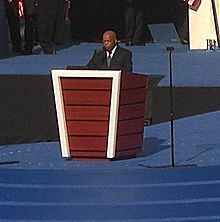 "Rep. John Lewis reflects on the 50th Anniversary of the March on Washington". The Grio. Entertainment Studios LLC. Retrieved 24 September 2016. ^ Kinnard, Meg (2016-02-13). 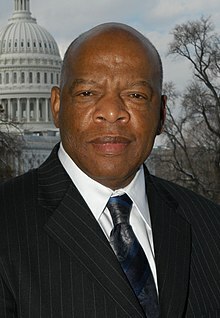 "Rep. Lewis softens dismissal of Sanders". Burlington Free Press (online ed.). Burlington, Vermont. Associated Press. Retrieved 2019-02-25. ^ Temple-West, Patrick (2016-02-15). 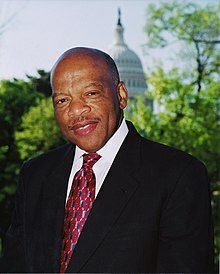 "Hillary Clinton's secret weapon: John Lewis". Politico.com. Arlington, Virginia. Retrieved 2019-02-25. 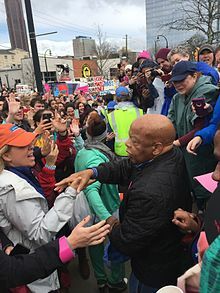 ^ "Trump maintains feud with Lewis: He also boycotted Bush 43". POLITICO. Retrieved 2018-08-06. ^ Post Editorial Board (January 18, 2017). "Trump should shrug off John Lewis' cookie-cutter insults". Editorial. New York Post. New York City. Retrieved 2019-02-25. ^ "Our Members". U.S. House of Representatives International Conservation Caucus. Retrieved 14 August 2018. ^ a b "Harvard awards seven honorary degrees". Harvard Gazette. 2018-05-24. Retrieved 2018-08-06. ^ Alexander, Brian (5 June 2018). 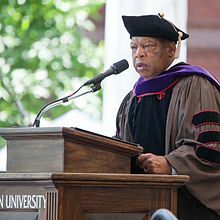 "Harvard Students Deliver Rousing Musical Tribute at 2018 Commencement Program". College A Cappella. Retrieved 16 December 2018.